Most times, spiritual things have natural parallels. 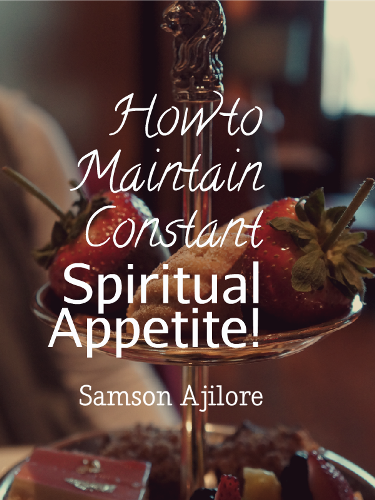 People often struggle to maintain constant spiritual appetite. Maybe one listened to a preacher on Sunday and decided to stay red hot for the Lord and to walk closely with Him, but after a few days one finds out that it is difficult to even pray or read his Bible. Maybe he is even the type that has struggled over and again to keep constant spiritual life but all his efforts has been to no avail. The answer is the Spirit and the Word; yielding to them will help him to make it. Come to think about it, supposing one goes for a while without eating what would happen? His belly will start telling him it needs food or if it is water that one has done away with for a long time, one’s throat will tell him it thirsts. However, if one goes on a long fast, he will reach a point where he will lose appetite for food completely, and his belly will no longer desire it because the organs responsible for producing the appetite for food and processing it seems to have gone to sleep. If one then keeps on this way without food, then it will result in death but for the system to begin to walk again, for it to be alive and healthy, one needs to begin to eat gradually, and mind you, some people have died for rushing meals after such a long fast. As he gradually but consistently begins to eat again, then the system starts getting awake from a long sleep and it begins to hunger gradually again for food. The spiritual appetite is like the natural one. If we walk in the light as the Father in the light, we have fellowship with one another, if we give diligent time to the study of the Word and prayers, if we practice the invisible presence of God, by returning inward, to the innermost being wherein He dwells, then, we will long for more of Him and will crave for Him over and again and the outward things of this lower temporal world will not break in the line. But if we stop fellowshipping with Him and stop attending diligently to His Word and worship, if we stop fellowshipping with the Spirit and withdraw to the lower outward life of daily routine, if we start seeing earthly things more than we attend to the heavenly One within us, then, our appetite for the presence and the Word begins to wane off and our spiritual life begins to dwindle gradually until there is no appetite for spiritual things anymore. This is how folks often get into all kinds of negative addictions until they get their conscience to the state where it becomes as though seared with a hot iron; when their desires for carnal things overtakes their desires for spiritual things and they persist in that state of darkness long enough until it becomes fastened to their soul as a stronghold that they return into over and again. But the weapons of our warfare are not carnal but are mighty through God to the pulling down of strongholds (1 Cor.10:4). This state of faint spiritual appetite is so terrible that it is highly unprofitable for us to be caught up within but everything begins with a choice. The Spirit of the Lord will constantly and gently deal with us to get back inward, but the things of this world could be so fastened to our senses that we will not even feel spiritual or have feelings for spiritual things at all, but thanks be to God that we do not have to depend on our feelings because if our natural impulses or feelings are spiritual, then of what necessity would faith be? Until we get back into the washing of water by the Word, we will not be able to rid our mind of those earthly viruses or filthiness that has clanged tenaciously unto it. It is the entrance of the Word that gives light because the Word is light and this light will shine so brightly to the burning off of all the lingering darkness in our soul if we will persist in it long enough (Psalm .119:130). Thanks to God that He can shake us to revitalization and bring us inward back to the deeper life again. Have you ever felt like having those early appetites that you once had, when you first got saved again? It is possible in the presence! We must constantly chose to retreat inward, to get back into the place of hunger and thirst for spiritual things, thus the Scripture charged us to be constantly filled with the Spirit because we must come to drink again and again from the living water. In Acts 2:4, the apostles were filled with the Spirit and they were filled with the same Spirit again in Acts 4:31. We must constantly return to the Spirit and the Word of Love. There is such thing as keeping filled with the Spirit! The Ephesus Church was not a carnal Church, yet Paul charged them to be filled with the Spirit; this denotes been constantly filled with the Spirit, (Eph.5:18). The inward life is a deeper life, for the laws of God is written within us and we cannot err as long as we follow the inward voice of the constraining love of our jealously loving Father, who will stop at nothing to ensure that nothing comes between us and Him. Constant thirst and hunger for God qualifies a man for life transforming encounters and divine transfiguration. There is always more with God! God’s love will never let you go! “This book of the law shall NOT DEPART OUT OF THY MOUTH; but thou shalt MEDITATE THEREIN DAY AND NIGHT, that thou mayest observe to do according to all that is written therein: for then THOU SHALT MAKE THY WAY PROSPEROUS, AND THEN THOU SHALT HAVE GOOD SUCCESS (Joshua 1:8).